Tired of the holidays yet? Since retailers started putting up decorated trees just after Independence Day, we understand if you're a little worn out. Still, there's a month to go until Christmas Eve, and there's nothing like a family outing to divert your kids from thoughts of changing their wish lists … again. So, in the spirit of the season, here is a list of 40 family-friendly activities to consider. Some are free, some are cheap and a few are pricey. There are outdoor and indoor events. Classical karaoke: Go all "German Idol" with the "Sing-It-Yourself Messiah." $15. 4 p.m. Dec. 4. St. Matthew's Episcopal Church, 8134 Mesa Drive.www.chorusaustin.org ; 719-3300. Pioneer yuletide cheer: Musical PBS duo the Biscuit Brothers present a holiday hoedown. $10. 5:30-7 p.m. Dec. 3. Pioneer Farms, 10621 Pioneer Farms Drive.www.biscuitbrothers.com . The sounds of hoofs ain't just for roofs: Child and adult dancers hoof it to a jazz trio's take on Tchaikovsky in "Of Mice and Music: A Jazz Nutcracker." $25. Dec. 8-18. Boyd Vance Theater at the Carver Museum and Cultural Center, 1165 Angelina St. www.tapestry.org . Holidays on ice: Sharpen your blades and head to Oasis Texas Village, home to a new 1,760-square-foot ice-skating rink. The site of Austin's popular sunset-watching Oasis restaurant also boasts four other eateries and retail shops including the new Blue Genie Art Store for your holiday shopping. $10 (includes skate rental). Through Jan. 1. 6550 Comanche Trail. www.oasistx.com ; 761-5301. Classic films, classic venue: Holiday movies at the Paramount Theatre, 713 Congress Ave., include "White Christmas," Nov. 28; "Scrooged" and "Love Actually," both Dec. 18, 19. $6-$10. www.austintheatre.org ; 472-5470. Happy Chanukah: Celebrate the Festival of Lights at the Chanukah in the Hood community festival. Yiddish cowboys, Klezmer musicians, choirs and face-painters entertain while crafts and food - including latkes and sufganiot (jelly doughnuts) are available for purchase. Free. Dec. 11. Central Market, 4001 N. Lamar Blvd. 735-8030. Puppets and party poopers: "A Very Fairy Christmas Carol" is a holiday theatrical mash-up! Children's theater characters including Pinocchio (as Tiny Tim), the Ghost of Christmas Past, Penelope the Party Pooping Fairy and Peter Pan appear in this creative adaptation of Charles Dickens' "A Christmas Carol." $4-$10. Through Dec. 18, Scottish Rite Children's Theatre, 207 W. 18th St. www.srct.org ; 472-5436. Traindeer games: Sometimes Santa likes to use other forms of transportation besides the sleigh, like the North Pole Flyer. Besides, Rudolph and the team need to rest up for Christmas. This 2- to 2-1/2-hour nonstop round trip includes a gift for each child from Mr. & Mrs. Claus. $30-$40. Nov. 27-Dec. 18.www.austinsteamtrain.org . 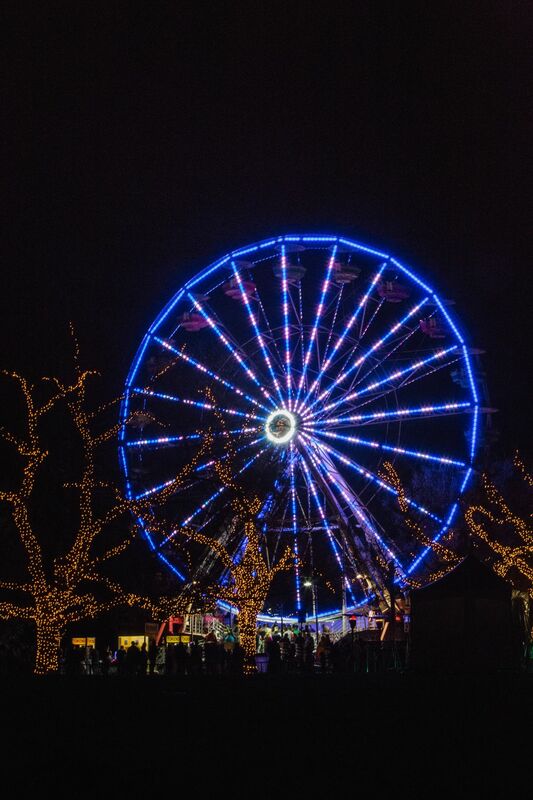 Six Flags over the North Pole: Lights, shows, festive attractions, carolers, Santa, iceless skating and a nativity complete with live animals highlight the holidays at the amusement park. $36.99. Nov. 25-Jan. 1. I-10 West and Loop 1604, San Antonio. www.sixflags.com/fiesta Texas. Make an ornament: That's just one of the activities kids and their families can join in at the Renegade Craft Fair Holiday Market. Others are perusing the wares of more than 150 indie crafters, mugging for a free photo booth and jamming to spinning discs from Waterloo Records DJs. Free. Nov. 26-27. Palmer Events Center, 900 Barton Springs Road. www.renegadecraft.com . Ho, ho, hotels: The Driskill Hotel, 604 Brazos St., hosts holiday events all December long, including a free tree-lighting ceremony with popular Austin musicians on Dec. 1 and Breakfast with Santa on Dec. 10, $25. Reservations: 391-7039. Info on other events: www.driskillhotel.com. The Four Seasons, 98 San Jacinto Blvd., offers a variety of family holiday events. Kids can sip tea with Santa at Teddy Bear Teas, ($30-$40, Dec. 3-18) and the hotel's pastry chefs host a gingerbread house decorating workshop ($45, Dec. 18). Reservations are required for both events at 685-8300. The lobby's tree is alight, and gingerbread houses up for auction remain on display through Jan. 2. www.fourseasons.com/austin . Help light the Zilker Holiday Tree: Attention, pint-sized Picassos - pull out those crayons, markers and paint and get to work! Kids ages 5 to 10 who produce the most creative renditions of the Austin holiday landmark will help light the tree on Dec. 4. But hurry, entries must be received by 5 p.m. Monday. Information, rules and entry form at www.ci.austin.tx.us/zilker/zhtartcontest.htm . Go all George Washington: I cannot tell a lie … I love driving out into the country Griswold-style and chopping down my own Christmas tree. Here are a couple of farms within driving distance of Austin: Evergreen Farms, 242 Monkey Road, Elgin.www.evergreen-farms.com , (512) 281-4833; Elgin Christmas Tree Farm, 120 Nature's Way, Elgin. www.elginchristmastreefarm.com , (512) 281-5016. Both open Nov. 25. `The Nutcracker'? Sweet! : You know those sugarplums that dance in your head this time of year? They actually appear on stage, too, along with mice, snowflakes and local celebs as Mother Ginger, all accompanied by the Austin Symphony Orchestra. $15-$74, plus service fees. Dec. 3-23, Long Center for the Performing Arts, 701 W. Riverside Drive. www.tickets.balletaustin.org ; 476-2163. Critter Christmas: Why should humans have all the holiday fun? After all, who enjoys tearing around the house with a stocking more than Fido? Bring your special animal friend to take a picture with Santa (insert claws/Claus and Santa's dry cleaner jokes here). All sorts of pets are welcome, but the event seems perfect for - wait for it - lap dogs. Free (photos available for purchase). Dec. 6. Highland Mall, 6001 Airport Blvd. (512) 454-9656. Raise your voice: The Austin Symphony Orchestra provides the music, you provide the vocals. Free (but tickets, available Dec. 1, required). 8 p.m. Dec. 13, Riverbend Centre, 4214 Capital of Texas Highway N., Austin.www.austinsymphony.org . Since there's no Austin Trail of Lights: Any truth to the rumor that Buda is an acronym for Best Unweird Decoration Alternative? Find out at the southern suburb's own Trail of Lights at historic Stagecoach Park. Free. Dec. 14-21, 880 Main St., Buda. (512) 312-0084. Make a run for it, 'k? : Whether your family wants to make a pre-emptive strike on those Thanksgiving calories or just get in shape for that Dec. 25 sprint from the bedroom to the Christmas tree, there's nothing like a 5k, kids' K or a brisk walk to prep for the holidays. If you happen to be reading this early on Thanksgiving Day, there might still be time to make it to the ThunderCloud Subs Turkey Trot benefiting Caritas of Austin. The Kids K starts at 8:45 a.m. today. $8-$28. Long Center for the Performing Arts, 701 W. Riverside Drive. www.thundercloud.com . Next month, The Jingle Bell 5k benefits MADD. $10-$30. 7 a.m. Dec. 4, The Domain, 11410 Century Oaks Terrace. jinglebellrunformadd.org . God bless us, every one: Christmas lovers and Scrooges alike can time travel back to Victorian England at the annual Dickens Christmas in Lockhart. A lighted parade kicks off the festivities, which include carriage rides, choirs, bagpipers, Santa and the lighting of the yule log (sorry, kids … no truth to the rumor that if it stays lit, we get six more weeks of presents). Free. Dec. 2-3,www.lockhartchamber.com/Dickens.htm . Silver Bells? Silver screen: There are half a dozen family flicks running through the holidays - "Happy Feet Two" (now playing), "Arthur Christmas" (now playing), "The Adventures of Tin-Tin" (opening Dec. 21) and "We Bought a Zoo" (Dec. 23) included. But the most highly anticipated are Martin Scorsese's live-action "Hugo" and the return of "The Muppets," both now playing at a cineplex near you. Read reviews of both at austin360.com/movies . Walking (or driving) through a winter wonderland: Organized holiday activities can be fun, but some great family time can be spent walking or driving around your own neighborhood, enjoying neighbors' holiday decorations (in the spirit of the season, resist the urge to report unkempt yards to your HOA). If your 'hood lacks cheer, Austin's 37th Street (just east of Guadalupe Street) is always a sure bet for decorative excess. Top off the tour with a trip to Mozart's Coffee Roasters, 3826 Lake Austin Blvd,, for hot cocoa and other beverages while you compare notes - the cafe has impressive, Trans-Siberian Orchestra-accompanied synchronized light shows nightly. mozartscoffee.com . Night court: When's the last time you went to the County Courthouse without a summons in your hand? Turns out county seats in Texas like to make spectacles of their town squares by flipping the switches on trees and Courthouse lights for the holiday season. Check out these nearby illuminations: Burnet County Courthouse, Main Street and Washington in Burnet; Blanco County Courthouse, 101 E. Pecan Ave., Johnson City (starting Nov. 25); Williamson County Courthouse, 101 W. Seventh St., Georgetown (starting Nov. 25); Bastrop County Courthouse, 804 Pecan St., Bastrop (starting Dec. 9). Keep Austin bazaar: The granddaddy of Austin holiday art fairs is the Armadillo Christmas Bazaar. $5-$8, Dec. 14-24. Palmer Events Center, 900 Barton Springs Road. www.armadillobazaar.com. The more avant-garde Blue Genie Art Bazaar, free entry, runs Nov. 30-Dec. 24 at Marchesa Hall and Theatre, 6226 Middle Fiskville Road. bluegenieartbazaar.com .